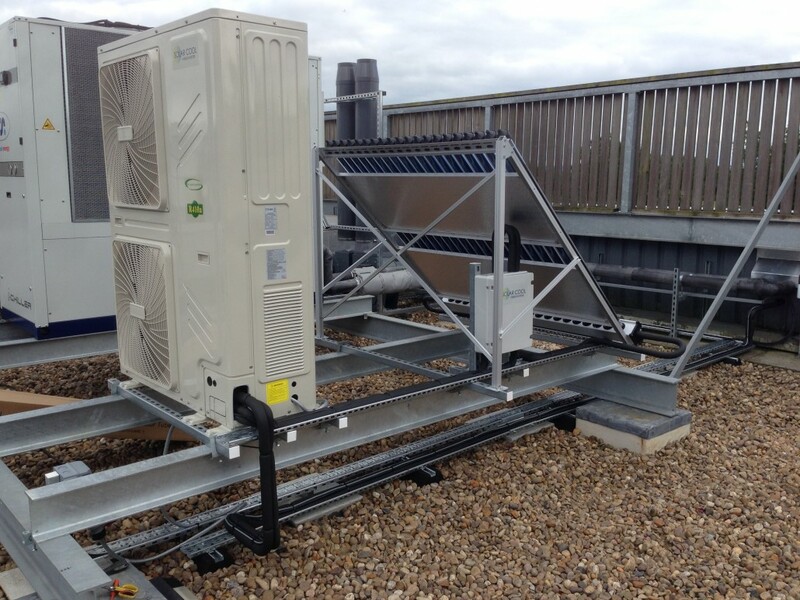 Aircon Services has just completed their first Solar Cool installation for the Engineering Department Oxford University on the Begbroke Science Park. 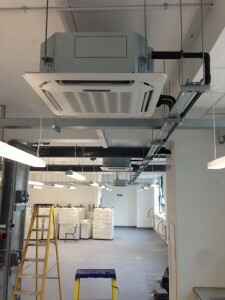 The installation comprised a Mini VRF system with three indoor cassette units and the solar panel mounted adjacent to the condensing unit. Solar Cool uses an exclusive patented process, based around the Ideal Gas Law, situated between the Compressor and Condenser. Utilising the free available energy from the sun to heat the refrigerant & subsequently reducing the workload of the compressor/s, thermo dynamics. As the free energy from the sun heats the refrigerant, it is provided with thermal energy, this in turn raises the internal energy (the sum of all microscopic kinetic and potential energy of the molecules). The molecules now move with a higher value of kinetic energy, which simply implies each molecule moves with a higher velocity than before. Now the molecules collide with one another and rebound with an increased energy, moreover intermolecular forces weaken and the molecules space out further, which means an increase in gaseous volume, and therefore a naturally increased volume flow, resulting in an improved Delta T in the condenser, subsequently producing the unequalled cooling and heating process of solar thermal. In heating mode the system works in almost the same way, but now the flow changes compared to the cooling mode. The additional free heating of the refrigerant in the solar panel allows the compressor to reduce it’s load and therefore it’s power consumption. Dependant on sun levels, COP figures (heating capacity vs power consumption) of over 8 are possible! Again the more the sun shines, the more the solar panel takes over the compressing of the gas and the more power is saved, as the compressor now acts mainly as a pump providing the necessary cycle flow. It has been proven to reduce annual energy consumption by up to 60%, if you would like to know more about Solar Cool or you would like to reduce your energy consumption on your next air conditioning installation call now! 0800 9989135.